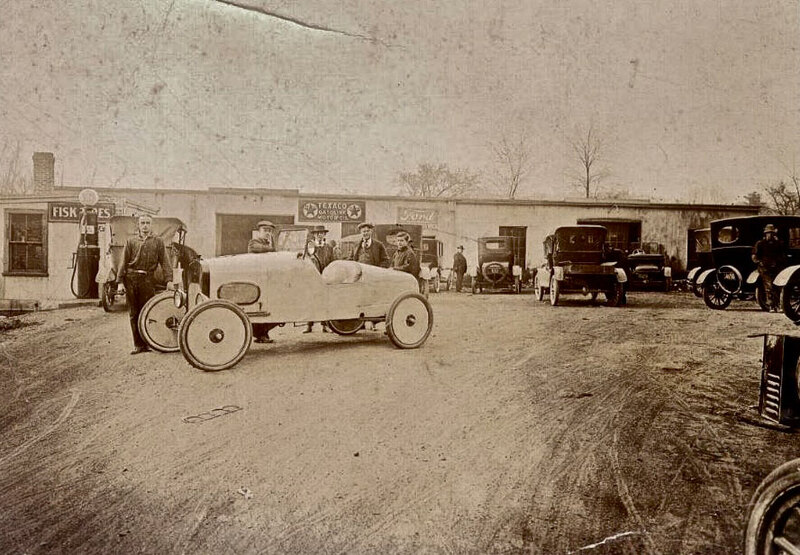 Photos of early garages are very interesting if you study the contents. 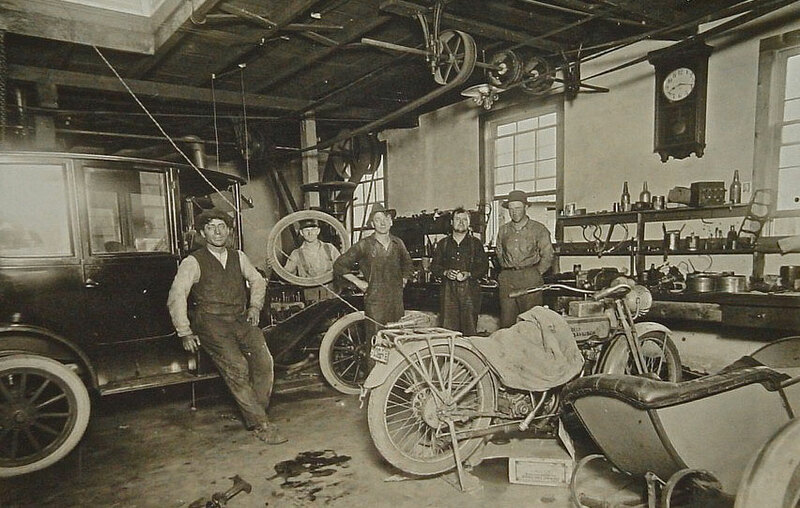 Here we have a center-door Model T and a Harley-Davidson with its sidecar detached. These vehicles might date the photo to the mid twenties. The overhead shafts and belting might have powered a lathe and a drill press over on the side wall. There is also a quite deluxe 8-day regulator clock up on the wall over the bench. The one thing that is very different from today are the big windows for light and what possibly looks like a sky light in the top left of the photo. Back in this time electric lighting was sparse and natural day light was what most people worked by. Whether by design or by accident they were right about the light. Natural light is much better than any other. "Whether by design or by accident they were right about the light. Natural light is much better than any other." may have enjoyed a few drinks on occasion, note the bottles on the top shelf. Did anyone notice the Model T head gasket laying on the ground in front of the speedster in the bottom photo? It appears that it may have been wearing a manufactured body, can anyone identify it?? Top image T jack on the floor and several T head gaskets hanging, plus T coil box on shelf. Sure can see the T was a large part of the work in this garage. Love the windows as noted. I also see they are open, so maybe summer time. Even in grubby work, almost all have a hat on. Looks like a big shop door open behind the photographer. Note that the clock may have been stopped and the hands set at 8:20. That was a popular "pose" for clocks in those days. Rumor was that this displayed the time of President Lincoln's death but it's not true. It's just nice symmetry for the hands.